Join the fun at EVICS weekly playgroup where parents and children come together for art, games, singing, stories, and active play. This play group is designed for children ages 0-5, but older siblings are always welcome. In the winter months Playgroup will be indoors, which allows for active games to get us all moving. Get to know other families in the community and get connected to other family activities. No need to RSVP, just drop in at 10:00am each Wednesday. We’ll follow the school district weather cancellation policy and will cancel if schools are closed. Check us out on Facebook for the latest in Playgroup themes, weather information, and other information about EVICS or this printable flyer. 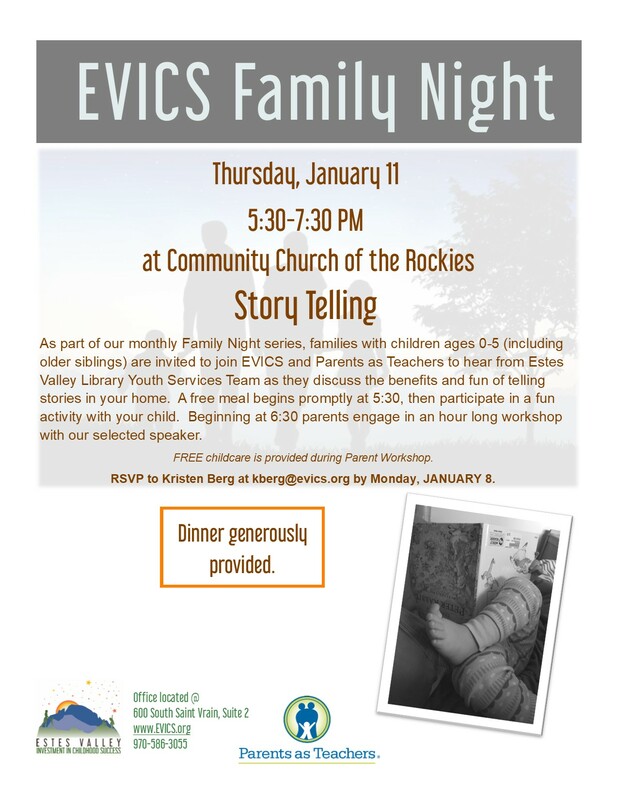 If you have questions or would like more information, contact us at kberg@evics.org or call the office, 970-586-3055. See you Wednesday at Playgroup!! EVICS wants to meet the diverse needs of every family in the Estes Valley Community. At our programs and events, our Bilingual Parent Educator is often present. If you would like translating services at any EVICS programs, please contact us.